🙋‍♂️ Need help in buying HPE 726907-B21 H240 12Gb 2-ports Int Smart Host Bus Adapter? Please contact us now. 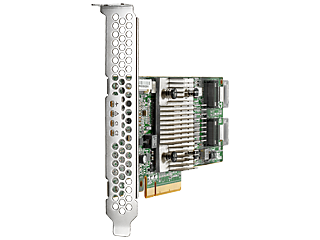 The HPE H240 Smart Host Bus Adapter comes in a low profile, PCIe3 x8 standup form factor that provides a reliable, high performing SAS connectivity to the data in the server internal drives. Featuring eight internal physical links, it delivers 12 Gb/s SAS performance. The H240 Smart Host Bus Adapter provides flexibility to run as an HBA mode or simple RAID mode. When operating in simple RAID mode, it provides RAID 0, RAID 1, and RAID 5 with optional HPE Secure Encryption capabilities. Unlike the HPE Smart Array Controllers, the H240 does not offer any acceleration or support cache modules.